In 2008 I chanced upon a reference to the Hydra-Jac, a lightweight (13 pounds versus the Hi-Lift’s 30), hydraulically operated jack with what appeared to be a similar range of lift travel to the Hi-Lift. 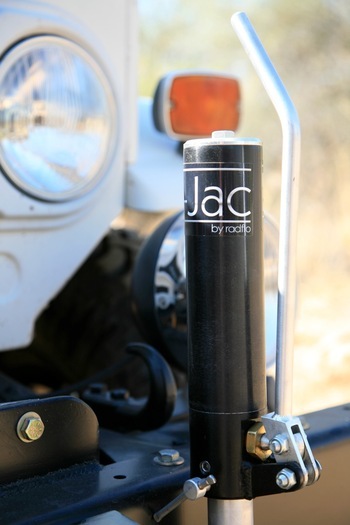 The Hydra-Jac is manufactured by Radflo, a company already well-known for sophisticated long-travel shock absorbers designed for race vehicles and rock buggies. It seemed a logical step for them to apply this expertise to a long-travel jack. It was clear the Hydra-Jac was not designed as a replacement for the Hi-Lift, given its relatively modest 2,200-pound capacity compared to the Hi-Lift’s nominal 4,660 (although the company’s website refers to “that old-fashioned cast-iron jack you’ve been lugging around”). But it seemed a fair trade given the handiness and what promised to be much easier and safer operation, via a short lever that didn’t appear capable of doing much damage even if you did manage to get your head between it and the cylinder. A one-ton-plus rating should be enough to lift one end of most medium-sized 4WD vehicles clear of the ground. The price was wincingly high at over $300—three times the price of a Hi-Lift—but if the performance justified it, I thought the Hydra-Jac might represent a viable alternative if used within its design parameters. Notice I mentioned that was 2008? I spent the next two years trying to actually get a Hydra-Jac to test. The fault was not with Radflo’s independent public relations rep, who was eager to help. But the first time I requested a unit to review, he told me another publication had been promised “exclusive rights” for the first article, and I couldn’t have one for several months. Um . . .okay. The next time I checked, I was told the company had agreed to loan a jack to me for testing if I guaranteed it would be returned “in the same condition in which it was shipped.” Say what? It’s a jack—the first time I used it, much less tested it, its condition was bound to change. I said no thanks. A year later I tried again. This time it was mentioned that the owner of Radlfo “might have apprehensions about loaning the product to journalists he’s never met,” and that I should drop by the booth at SEMA to introduce (i.e. ingratiate?) myself. By now I was beginning to wonder if I was wasting my time, and if there was another reason Radflo didn’t want their jack tested in the real world. I skipped SEMA that year anyway for other reasons (not really into posters signed by Hooter’s girls). But, astonishingly, in another few months the skies parted and a Hydra-Jac appeared at my shipping depot. On first inspection I couldn’t see what all the hesitation had been about. The Hydra-Jac appears to be very well-made, and adequately specced for its metric-ton rating. The piston is a 22mm chrome-plated rod, sleeved with a 35mm steel tube. The operating handle looks absurdly delicate compared to the blunt-force-trauma club of a Hi-Lift, but it implies easy cranking. The actual travel of the piston (and thus the lifting foot) is 18 inches—not a lot when you realize a Hi-Lift’s foot will climb nearly the full 48 or 60 inches of its main beam—but the Hydra-Jac’s foot can be loosened and repositioned to suit the application, which increases versatility. Complementing the light weight is its compact length—just 37 inches (a 48-inch model is also available). First off, you won’t be doing any winching or vising with the Hydra-Jac. It’s made for jacking, period. I suppose you might be able to wedge the round base on a chassis member to pry off some bent sheet metal or straighten a tie rod, but essentially this tool is made for lifting things. I first tried a simple face-off by jacking up the back end of my FJ40 until both wheels were in the air. Using the Hi-Lift, the procedure is to make sure the reversing lever is in its ‘up’ position (it should always be stored thusly), after which it’s possible to pull the mechanism and foot of the jack up the main beam with the operating handle until the foot meets the bottom of the vehicle’s bumper. Making sure the jack is vertical and well-located, one then pumps the operating handle, keeping (gloved!) fingers out of the space between the handle and the main beam, and most definitely keeping one’s head out of said space. Without too much effort the rear wheels were dangling. Moving the reversing lever to ‘down’ (which usually involves a swift bang with a fist), and the procedure is essentially reversed. Once the jack has less than around 150 pounds pressure on it the lifting mechanism will drop to the base (this characteristic has caught more than one new Hi-Lift user by surprise). With the Hydra-Jac, effort from start (picking up the jack) to finish (lowering the vehicle) was vastly reduced. 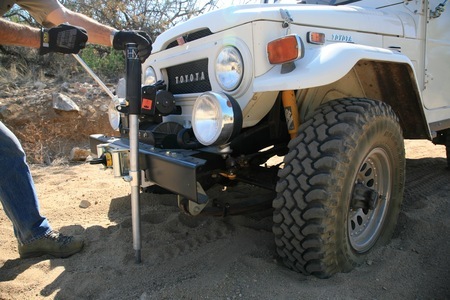 The movable foot happened to be in the right position to engage the Land Cruiser’s bumper, so I simply tightened the hydraulic lock valve on the jack’s tubular body, and began working the lever. No opportunity without considerable trouble to put oneself in harm’s way—there’s never any recoil potential on the lever. In 15 seconds the tires were in the air, after which it was the work of a second to loosen the lock and lower the vehicle. Control was good enough to bring it down a millimeter at a time, or all the way with a whoosh. First round to the Hydra-Jac. Then it was time for a recovery. I decided to bury the front (heavier) end of the Land Cruiser in sand and use each jack to lift it high enough to place sand mats under the tires. Normally this isn’t my preferred method of sand recovery, since it forces you to lift the body of the vehicle far enough to max out the suspension travel before the wheels begin to rise, whereas if you can get a bottle jack under the axle you only need to lift a fraction of the distance. But I wanted to put the jacks at their most disadvantageous. I drove down to the wash that feeds our cattle tank. It has a sandy but not treacherously soft surface. As usual, when you want to get a vehicle stuck it’s nearly impossible. In two-wheel-drive with full street pressure, time and time again I revved the engine and popped the clutch, and the FJ40 just pulled on out. Finally I managed to spin a couple of rather pathetic holes, pulled the front wheels into them, and shoveled sand back around the tires. Again the Hi-Lift was first. I didn’t bother with the big red plastic ORB jack base, but the Hi-Lift’s base barely sank as I started pumping the handle. It took considerably more effort to raise the front of the 40 with that massive cast-iron six in there, plus the suction of the sand. The ironic thing about the Hi-Lift is that the harder it is to pump, the more difficult it is to keep one’s head out of the Danger Zone arc of the handle, and the more dire the potential consequences if one’s grip slips. But, as usual, the thing does work, and out came the tires. Now for the Hydra-Jac. This time, the foot was too high on the shaft to get under the front bumper. So I had to get a wrench to loosen and lower it to the correct height, rather than being able to instantly adjust for any starting height as with the Hi-Lift. More interestingly, as soon as I began pumping the operating lever, the Hydra-Jac’s round base headed straight for China through the gravelly sand. It sank at least seven or eight inches before the Land Cruiser started to rise, and I ran out of travel before the tires were high enough to insert sand mats. Some quick math explained it. The Hydra-Jac’s round base is four inches in diameter, giving it just 12.5 square inches of area. The Hi-Lift’s four by seven-inch rectangular base has well over twice the area—28 square inches. I retracted the Hydra-Jac’s piston and put the ORB base underneath. Even though not designed for this jack, the ORB gave plenty of support, and the Land Cruiser rose much quicker. Pumping the hydraulic arm required significantly more effort than when raising the back end on firm ground, but was still infinitely easier than working the Hi-Lift. However, I noticed another quirk regarding the Hydra-Jac. Its design means that the hydraulic ram, which is attached to the base, is free to rotate inside the cylinder. The result was that if the vehicle was not perfectly level side to side, the jack tried to swivel on its foot against the bumper. I came close to tipping the vehicle sideways off the jack, as if I were employing the classic “casting jack” technique to move the vehicle sideways out of a rut. So round two went to the Hi-Lift, which, despite the greater effort and care required, was actually faster and less troublesome than the Hydra-Jac. Since recovery is the most vital—and the most common—use to which either of these jacks is likely to be put, I had to conclude that the Hi-Lift remains the most versatile jacking tool for backcountry travel. I do think the Hydra-Jac has potential. If the base were enlarged it would solve one major drawback. If some way could be found to prevent the ram from being able to turn inside the cylinder, I believe the jack would gain significantly in control and ease of use. Its light weight, ease of storage, much lighter pumping action, and greater margin of safety are obvious advantages. The last thing I would have liked to test was the Hydra-Jac’s durability, especially regarding the hydraulic mechanism. Hi-Lifts might get ornery and stiff, but they rarely break. Alas, Radlfo declined to leave the jack with me for a long-term test. So, for now, at least, I’m back to cursing—and counting on—my well-used Hi-Lift jack. Older PostWhat is the safest way to carry enough water for an extended trip?